Excerpt of review by Sophia H. Stitch ~ I'm pleased to know this book documents the things no longer taught to the current caretakers of death.Their teachings are limited to only the care of the body ignoring the rich wealth once known about the cemetery and the interrelationship of the living and the dead. Woooooot! 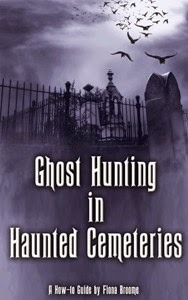 The long-awaited 2015 edition of “Ghost Hunting in Haunted Cemeteries” is now in Kindle, and it's a much bigger, more powerful book than ever before. Sure, since the first edition came out in 2009, this has been the go-to book for anyone interested in haunted cemeteries. Ghost hunter Fiona Broome has been investigating haunted places for more than 20 years. She knows what she's talking about. However, most ghost hunters only talk about haunted houses, eerie, too-quiet battlefields, and creepy, abandoned facilities like asylums and jails. They're overlooking important haunted sites in most communities: haunted cemeteries. “Ghost Hunting in Haunted Cemeteries” is a how-to guide. First, you'll learn about the different kinds of cemeteries, and which are most popular among ghost hunters and psychics with spiritual callings. Did you know that, traditionally, a “graveyard” was connected with a church, but a “cemetery” has always been a public place of burial? In this book, you'll discover lots of facts, but also some fascinating trivia. After learning how to find local haunted cemeteries, you'll learn what to look for when you visit them. Fiona explains how to identify haunted graves, and other areas in and near the cemetery where ghosts may linger. Remember, not all graves are marked. Fiona describes what to look for to find “forgotten” graves and their displaced headstones. Throughout this book, Fiona explains the ingredients that make many cemeteries haunted, and the power conflicts that trap some spirits due to their own misunderstandings... and sometimes their very real fears. You'll discover the best steps to take -- in daylight and after dark -- to get the most from your ghost investigations. Fiona Broome shares her best tips from cemetery safety to research techniques, and from quick-start research to spiritual protection.